On a cold morning last winter, The New York Times published a warming story about the rage for charter schools among hedge-fund managers. It appeared in “Sunday Styles,” and was a fine glimpse into the current fashion of “social entrepreneurship” and “philanthrocapitalism.” About the intentions of the rich young lions who donated large sums of money to schools in the most desperate parts of the city, there can be no doubt: these were good deeds. Children were lifted up, which is nothing to be churlish about. But as I read on, I felt uneasy. For a start, their interest in hot and heterodox methods in education sounded alarmingly like their interest in hot and heterodox methods in finance: “They aren’t afraid of competition or upsetting the system,” said a former member of the New York City Council who was hired—for $371,000 a year-to run one of the charter operations. “They thrive on that.” We know, we know. Also, the charter schools’ reliance on scores and metrics for standards of progress excited them: they had found God’s spreadsheets. And of course they thought big. One of them confessed that “helping the world one person at a time just isn’t for me.” The ancient rabbis taught that if you save a human being, it is as if you save the world, which I have always taken as a lesson not only in humanism—that the individual is absolutely significant—but also in meliorism—that the world will be saved slowly, a soul at a time. School teachers know this. Impatience is the reformer’s worst vice. But what irked me most was the usurpation of the moral prestige of the public sector by the social prestige of the private sector. Whatever they call it, this is charity; and one of the most effective methods for the delegitimation of government in our day has been the notion that charity may do the work of public policy, that private wealth is the answer to social crisis. To put it another way, the story of the chic charterists was a study in Bloombergism. “Private money can help solve even the most difficult public problems,” Michael Bloomberg declared in a blurb for Philanthrocapitalism: How the Rich Can Save the World, a book by Matthew Bishop and Michael Green that appeared in 2008 and is one of the primary anthropological documents of our era. “There are limitations to what the state can do,” they write, and so it is “no wonder governments, of both right and left, seem increasingly keen for wealthy individuals to give them a helping hand.” (They forebodingly add that “if the rich do not take on this responsibility, they risk provoking the public into a political backlash against the economic system that allowed them to become so wealthy.”) It follows, as they write later in their billet-doux to billionaires, that “a growing number of philanthrocapitalists are realizing that one of the most effective ways to leverage their money to change the world is to use it to shape how political power is exercised.” Enter Bloomberg. It was Bill Clinton, of course, who pioneered the super-valorization of the super-rich, in the Clinton Global Initiative, coming terribly close to a liberal version of the conservative doctrine that wealth is a mark of virtue (and writing the foreword to Philanthrocapitalism); but Bloomberg is its hero. A few weeks ago the Times reported that Bloomberg’s first deputy mayor will now serve simultaneously as the chairwoman and chief executive of Bloomberg’s foundation. 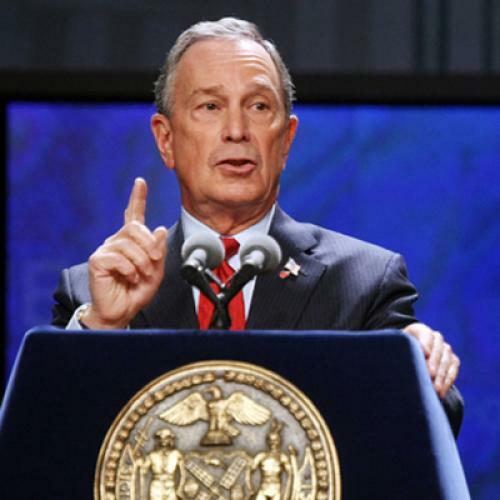 Bloomberg’s political use of anonymous charitable gifts through the Carnegie Corporation has been amply documented. This is not philanthrocapitalism. It is philanthrogovernment. If you feel any dissonance or discomfort about it, have yourself immediately examined for socialism. Is it plutocracy when a city is ruled by its richest man? Not if he came to power democratically, of course. But let us not be idiots: Bloomberg was elected semi-democratically. In 2001, he spent $74 million; in 2005, $85 million; in 2009, $102 million—$261 million in all. Even if he is doing a pretty enlightened job, he bought it. Moreover, he shabbily circumvented the term-limits law (which was what made the mayoralty available to him in the first place) by breakfasting with another billionaire and oligarchically obtaining an exemption from him. And now, in the battle over financial regulatory reform, he is defending the interest of Wall Street, and his own interest, against the interest of America, and pretending it is the interest of New York. If he were in Iowa he would be defending ethanol, no doubt as the ethanol king. The signature contribution of the philanthrocapitalist to the American political tradition is the idea that social problems have market solutions. In the midst of our present troubles, however, there is much evidence to justify a new look at the grip of American business upon the American policy imagination. Isn’t it now ruefully clear that it all depends? In her exhilarating and deeply humane new book, The Death and Life of the Great American School System, Diane Ravitch exposes some of the fallacies of the business paradigm, and insists (in a valiant chapter called “The Billionaire Boys’ Club”) that “there is something fundamentally antidemocratic about relinquishing control of the public education policy agenda to private foundations run by society’s wealthiest people,” who “represent an unusually powerful force that is beyond the reach of democratic institutions.” To whom, really, are they accountable? Right now there is no more pressing task for the renovation of our sense of our society than the critical examination of our attitude toward the very rich and the nature of their influence upon our public life. Our gratitude should be endless, but our worship has got to end. There is “an understandable prejudice that the rich are fundamentally self-interested and therefore not to be trusted with political influence,” Bishop and Green proclaimed in 2008. “But in the age of philanthrocapitalism, a more positive view of the engagement of the rich and their foundations in politics may be needed.” Not anymore. Billionaires can also be dumb and dangerous. The merit of an opinion or a policy has nothing to do with the social and economic position of the person who espouses it. Money never made anything true or good. The question of what sort of city New York should be is not the question of what Michael Bloomberg should do with his money. Charity is a blessing, but not when it is an expression of disdain for the democratically constituted state, which, for all its errors and exasperations, is still what protects us from many of history’s and nature’s punishments.